This guide provides information about how to design reports with R over Opal data. R being a programming language, any text editor could be used. In this guide we recommend to use the RStudio editor as it has reporting features integrated. RStudio is cross-platform, free of charge (Open Source Edition) and is available as a Desktop or a Server application. The Server flavor is more suitable for teams (shared development environment) and when restrictive security constraints apply (IP white-listing). See more information about Report Execution Flows. The following steps will walk you through the design of a report, tested in a development environment (R console/RStudio), then deployed in a production environment (Shell script/Opal). See an example of such a script: opal.R. Run it in a R console or RStudio. The R script can be enhanced with presentation directives as specified by knitr. We will chose the specific R report format based on Markdown. Detailed documentation can be found in the R Markdown article. See an example of such a report: opal-dev.Rmd. You can run it in RStudio as described in the Using R Markdown article. See the Opal Reporting with R output. 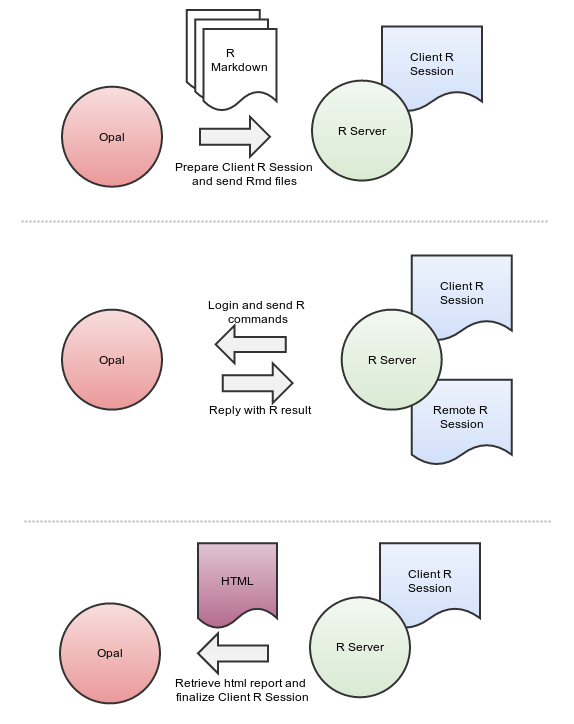 See documentation about opal.login function for available R options. See an example of a production report opal-prod.Rmd. Note that no user credentials is provided. RStudio cannot execute it as usual as the editor does not knit the report in the current R session. To execute this report you can use the opal.report helper function that will knit it for you. See an example of a R shell script running it: opal-exec.R. For executing it in Opal, see instructions on how to specify the R options in the Reports Administration documentation. archive and publish the reports generated. For more details see Reports Administration. If you have written a shell script, such as opal-exec.R example, it can be executed as any cron task. access to Opal variables description. The result of this report is a document that presents the data dictionary of a Opal table with figures and summary statistics. See Opal Data Dictionary with R output.